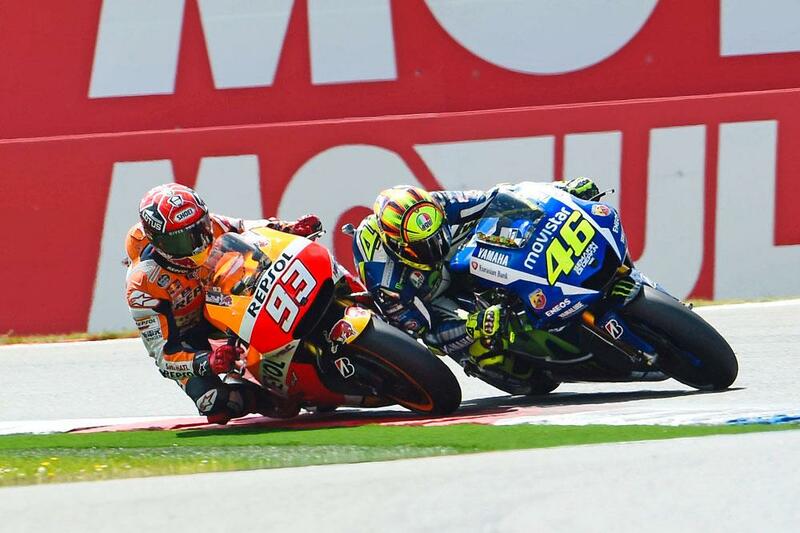 ﻿ How strong do you have to be to race in MotoGP? hile Doctor Zasa and his team of physiotherapists admit you have to be in great physical shape, part of what draws them to motorbike racing is that it isn’t how fit and strong you are on a bike that decides whether or not you win; it’s about talent. “For sure, MotoGP is a different kind of sport from most others, because you have a machine with an engine – and you don’t have to use all the muscles you use in other sports. “If you look back to the old days, you’d see riders smoking on the podium, drinking – they weren’t the same athletes. What made a huge change then was opening the gas earlier, braking later – being brave. ABOVE: Rossi doesn’t look particularly strong, especially next to gym-honed Marquez. But they both have the power and fitness to win a MotoGP. In case you’re wondering why Valentino and Marc look so friendly, this pic was taken in 2015 pre-season testing. Might not be so easy to organise now. The lady sharing the moment is Harley PR Vi Dinh. And while there’s no doubting that today’s top racers are athletes just as much as an Olympic competitor or a Premiership footballer (just look at that pic of Marquez! ), they don’t need to have the same incredibly detailed gym routines and training plans. And without that need for detail the rider can train at what he loves, rather than spend hours in a gym lifting the same weights. Cal Crutchlow, for example, spends enough time riding on the roads of the Isle of Man to be a pro cyclist, according to friend and world champion Mark Cavendish. For Valentino Rossi, it’s mixing it with his Academy apprentices on the flat track at his ranch. Dani Pedrosa is a windsurfer. Scott Redding is training for an Iron Man. So the MotoGP grid is an eclectic range of physiques. “Different riders are different shapes, depending on their height, their riding style, their preparation and their genetics. If you look at Cal Crutchlow, he is naturally big, and has big legs because he loves cycling. He does more training than he would need to even if he was a cyclist, but he loves it. “Valentino is relatively slim – he is an athlete and he trains, but he’s not so big from a muscles point of view. Lorenzo too, he is fit and trained, but he’s not big compared to others. It depends on the kind of training you do and the style when you ride. It’s genetic for some of them too, though. But key to all the working out, according to the Clinica physios, is not necessarily strength but flexibility. “You have to stretch; it’s better to stretch than to strengthen. Nowadays, some do yoga, pilates – things to keep their muscles loose, because they have to be quick on a bike. If you have big muscles and a big body, or if your muscles are tight, you can’t move around the bike. How will you spend your £10m across MotoGP, WSB and BSB? Video: What do all the buttons on a MotoGP bike do?